You’ve probably heard that the bees are in trouble out there. If you want to help them but you’re not really into turning into a full blown bee keeper just yet, check out the British Horticulturist Bee House, the little bee hotel you can install in your yard. This looks like a bird house only the entrance is way too small for any type of bird. 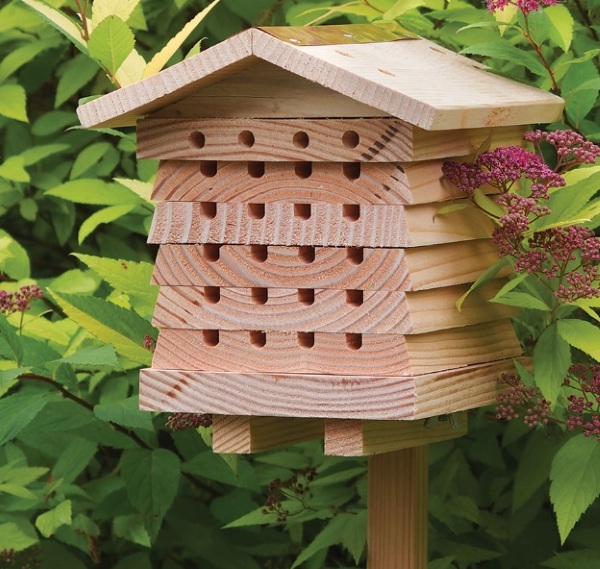 It’s meant to provide a safe and comfy home for solitary bees. These are the type bees that are into just being by themselves, no hives, they just live a solitary life, spending their time pollinating flowers and doing their part to keep nature going. They lay one larvae at a time which in turn grow up to live their solo lives as well. The bee house will help attract them which will help keep your garden lush. They don’t attack, they just pollinate. They also don’t make honey but they’re still an important part of the natural cycle. You can pick up a British Horticulturist Bee House for $39.95.